Former Cabinet Minister Michael Gove has warned a vote for the SNP will risk damaging the fragile recovery of the north-east economy following the downturn in oil and gas. 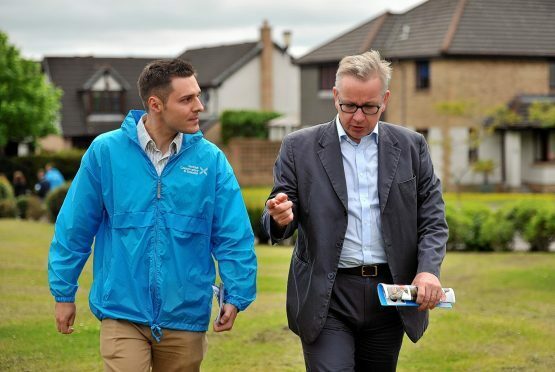 Speaking during a visit to Aberdeen to campaign for Scottish Conservative candidate for Aberdeen South, Ross Thomson, Mr Gove said he did not want to jeopardise the recent positive signs for the energy sector. Mr Gove, a former pupil of Sunnybank Primary, highlighted a recent Wood MacKenzie report on how uncertainty over a repeat of the 2014 vote could cost jobs and reduce investment in the North Sea. He said: “The north-east has undoubtedly gone through a very difficult period due to the downturn in the oil and gas industry, and the local economy remains fragile. “As the sector emerges from this slump, the last thing that we need is another divisive and damaging independence referendum in Scotland. “The Scottish people – no more so than here in Aberdeen – voted emphatically to reject separation in 2014. Mr Gove, who led the Brexit campaign, claimed leaving the EU meant the UK had to stick together. He said: “Now, as the UK prepares to leave the EU, this is a time for us to come together, not tear our great country apart. Ross Thomson said he was delighted by Mr Gove’s support. He said: “The downturn in oil and gas has hit this area very hard, and the local economy is still fragile. Meanwhile, Tory peer Lord Ashcroft has announced the results of a focus group he held in the Aberdeen South constituency. The poll indicates some voters who backed the SNP in 2015 are being turned off the party by its pursuit of independence and its stance on Europe. The peer conducted focus groups in Conservative target seats Aberdeen South and Edinburgh South West and spoke to SNP voters who also backed Brexit, which according to his polls following the EU referendum vote constitute one in three of the party’s supporters. Lord Ashcroft said the single biggest reason this group are now looking elsewhere is the SNP’s “apparently dogged pursuit of the independence agenda”.